General Description of AMACR / p504S. This antibody recognizes a protein of 54kDa, which is identified as AMACR, also known as p504S. It is an enzyme that is involved in bile acid biosynthesis, ? -oxidation of branched-chain fatty acids. AMACR is essential in lipid metabolism. It is expressed in cells of premalignant high-grade prostatic intraepithelial neoplasia (HGPIN), prostate adenocarcinoma. The majority of the carcinoma cells show a distinct granular cytoplasmic staining reaction. AMACR is present at low or undetectable levels in glandular epithelial cells of normal prostate, benign prostatic hyperplasia. A spotty granular cytoplasmic staining is seen in a few cells of the benign glands. AMACR is expressed in normal liver (hepatocytes), kidney (tubular epithelial cells), gall bladder (epithelial cells). Expression has also been found in lung (bronchial epithelial cells), colon (colonic surface epithelium). 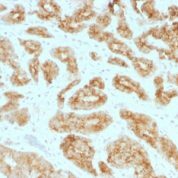 AMACR expression can also be found in hepatocellular carcinoma, kidney carcinoma. Past studies have also shown that AMACR is expressed in various colon carcinomas (well, moderately, poorly differentiated), over expressed in prostate carcinoma. Buffer and Stabilizer: Culture Supernatant with 0.05% Azide. Anti-AMACR antibody staining is expected to be primarily localized to the vesicles and plasma membrane. 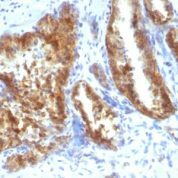 Variations in AMACR / p504S antibody staining intensity in immunohistochemistry on tissue sections are present across different anatomical locations. An intense signal was observed in cells in the tubules in kidney. More moderate antibody staining intensity was present in cells in the tubules in kidney. 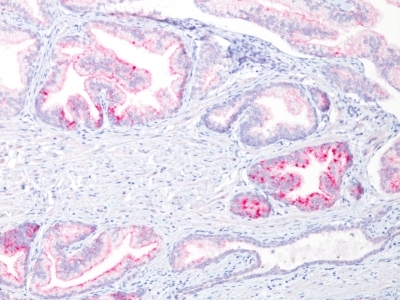 Low, but measureable presence of AMACR / p504S could be seen in cells in the seminiferous ducts in testis, epidermal cells in the skin, glandular cells in the adrenal gland, appendix, cervix, uterine, duodenum, endometrium, epididymis, fallopian tube, gallbladder, prostate, salivary gland, small intestine and stomach, islets of Langerhans in pancreas, macrophages in lung, neuronal cells in the cerebral cortex and hippocampus, Purkinje cells in the cerebellum and respiratory epithelial cells in the bronchus and nasopharynx. We were unable to detect AMACR / p504S in other tissues. Disease states, inflammation, and other physiological changes can have a substantial impact on antibody staining patterns. These measurements were all taken in tissues deemed normal or from patients without known disease. enQuire Bio's AMACR / p504S Anti-Human Monoclonal is available for Research Use Only. This antibody is guaranteed to work for a period of two years when properly stored.